It takes ages, and eventually freezes LR, to select a directory on my Amazon drive for publishing (28400 directories), 5Tb. is there any way not to have Photo Upload to rescan the whole drive and have ONE directory selected for good. The 500px uploader misses the original EXIF Lens field which is shown in the LR correctly. On the 500px in the published photos the Lens field is always empty. Please fix the 500px uploader. The latest plug-in now uploads the lens information from Lightroom. Please use the Update button to update to version 4.8.0. 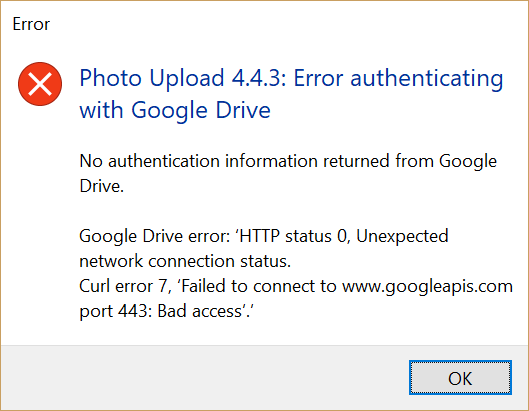 Upload to OneDrive does not work after your recent updates to 4.8.1. I have paid Licence Key and Full Access. You spotted a problem with the plug-in that is now fixed in version 4.8.3. Many thanks for your help testing the fix. where 5 represents the number of photos that failed. It is followed by a list of failing photos. If I republish these photos, they usually go through; but then they appear at the end of the album, rather than appearing in the same sequence in which they appeared in Lightroom. The plug-in (version 4.7.8) will now automatically retry when it receives a 408 error from the network connection. I’m not sure if my question is related to this plugin or if it is an issue of Lightroom in general. I have used a custom file naming scheme for my uploads using the element image number (Bildnummer in german). I was expecting that number to be unique for the photos at least in one collection. My problem now is that when an upload is interrupted due to connection errors and I restart it to upload the remaining photos this number starts at 1 again and overwrites the already uploaded images of my collection. 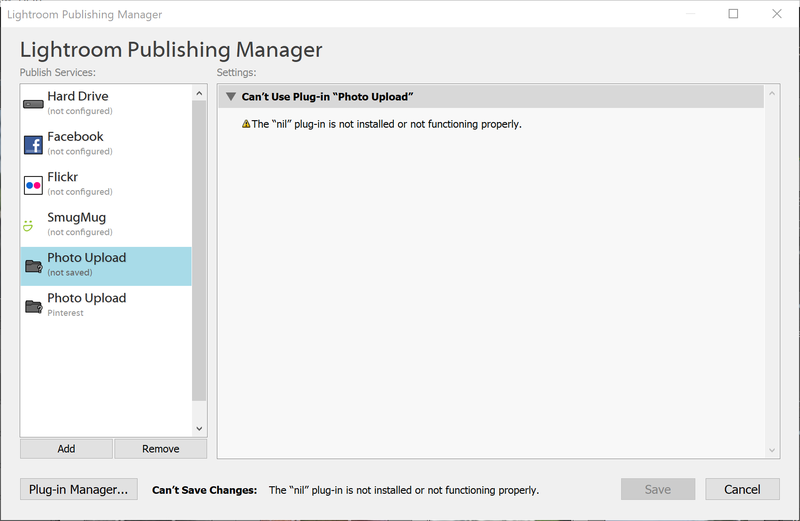 The lightroom help is not giving any hint at the meaning when using publish services. Normally this image number should be unique all across the catalogue but this is only described for the import file naming settings. As I don’t know if the plugin is in charge in passing that numbers to lightroom I’m asking here. The plug-in does not manage the file numbering, I’m afraid. This is a Lightroom capability. I did a few searches on Google and found that many people have asked the same question as you. Here’s one thread – https://www.lightroomforums.net/threads/numbering-on-export.28192/. I don’t think there’s an easy way to achieve what you need. I am using Photo Upload for Facebook and Google Photos, and both I’m able to upload photos to. But for “Google Photos” when I create a new collection and upload them, I get an error message a few minutes later saying it cannot find so & so folder on Google Photos, and references version 4.7. After that I close the error window and click on “publish” again, and the photos are successfully uploaded. You were just a bit too quick with the publishing, the new collection had not finished being linked to the album on Google Photos before you tried to publish to it. However I’ve looked into this and done some optimisations to the plug-in, so now you can publish as soon as you create your Lightroom collection. Thanks for confirming that the update has now worked for you with version 4.7.5. I am trying to export a Lightroom Folder Structure (three levels) to a remote FTP location. I am positive that I have understood all the settings and set them correctly. After hitting “export” I see that at the FTP location folders do arrive, but in no way in the same structure than I had them in LR. also files originally in a folder may end up in any other folder. most thankful for any input! You found a bug with the FTP part of the plug-in. It was not creating new folders correctly and causing the behaviour you experienced. This should now be fixed in version 4.7.4. Thanks for raising the problem and confirming it is now fixed. Using 4.6.6 line breaks in the ‘Caption’ field aren’t preserved in Flickr uploads (they seem to be replaced with spaces, roughly). I’m not sure if this is a regression or if it’s always done this… I only just noticed it. The plug-in has always (for a very long time) replaced newlines with spaces for titles and summaries. Some upload services are sensitive to newlines and throw errors if they receive them from the plug-in. However I appreciate your comment that Flickr does support newlines. So version 4.7.4 of the plug-in now supports newlines in Flickr titles and summaries and in Picasa Web summaries. 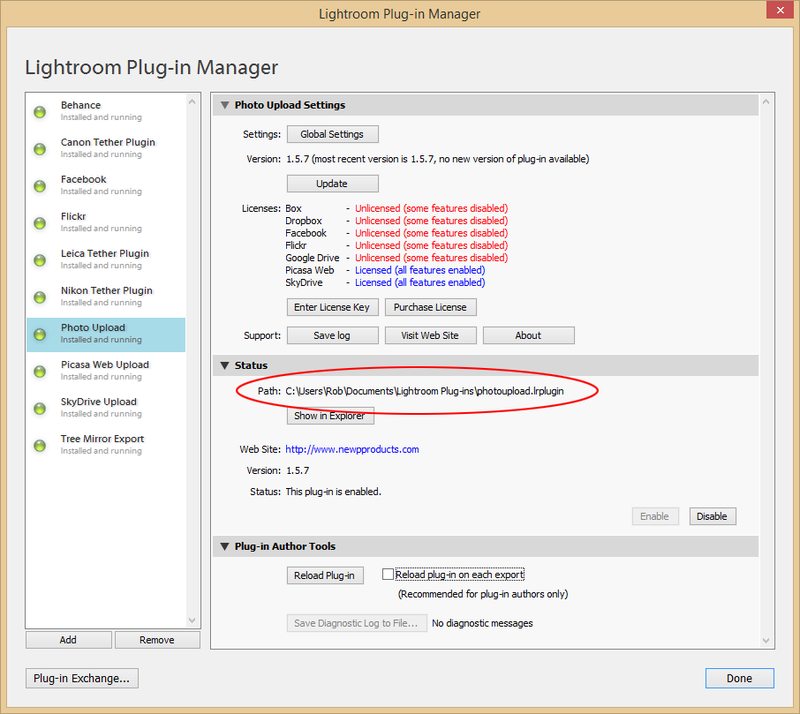 Do you know if smug mug will create a plug in to work with Lightroom 6.12? I had to upgrade to newer version of Lightroom when I bought the canon 5D mark iv. Thanks! Hi. Not quite sure what you mean. The Photo Upload plugin on this site works with SmugMug and the latest Lightroom. I don’t know what SmugMugs plans are for their plugin. This was down to you specifying a keyword for a 500px photo that was more than 255 characters. Version 4.7.1 of the plug-in now trims the keywords automatically for 500px so you should not see this error again. Why is LR become slow and unresponsive when i export . i have a powerfull computer so i dont understand why. When you export, Lightroom creates temporary copies of all your photos that are to be exported with all your edits applied. It does this at the start of your export in one go. So if you only export 1 photo the computer will only become unresponsive for a few seconds, but if you export hundreds then it may become unresponsive for a long time. 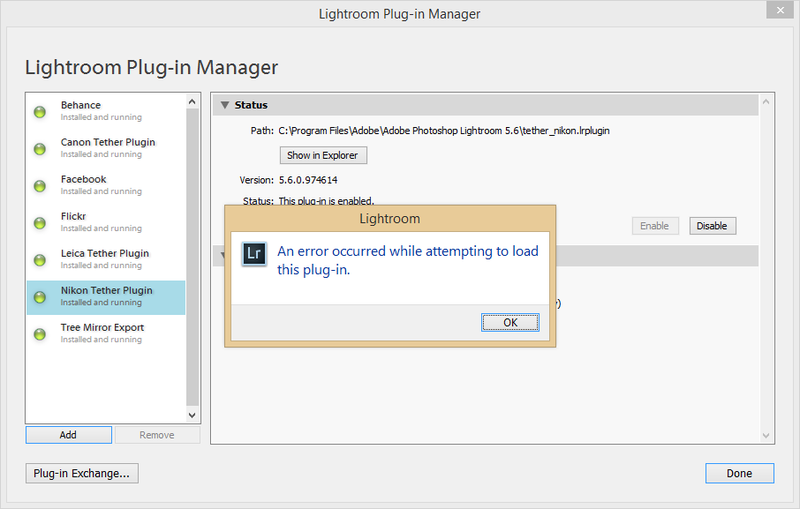 This is simply Lightroom’s behaviour, not the behaviour of the plug-in. You may find this setting useful – http://www.newpproducts.com/lightroom-plug-ins/photo-upload/settings/#Generate_exports_one_at_a_time. Photo Upload 4.6.8: Error uploading to Tree Mirror. The Tree Mirror album you have specified to redirect to does not exist on Tree Mirror. I can reproduce the problem on another computer as I get the same error. Is this a bug, or am I missing something? Ah you found a bug, apologies. It’s now fixed in version 4.6.9. I have 22k photos uploaded to Flick, which I included tags using Flickr UI, not LR. Is there anyway, I can import those tags back to LR, so I can upload my photos to another service without loosing the tagging? I can’t think of a way you can download the keywords/tags from Flickr, sorry. Current version 4.6.4 running on Mac OS Sierra (10.12.6) drops ALL exported photos to Picasa Web (Google Photos) as jpg files on my desktop and does not delete them after upload. Yes, they were successfully uploaded, but this is not an expected/desired result. Please check your Lightroom Export/Publish settings for your Export Location. It is probably set to export to “Desktop”, but you should choose “Temporary folder”. The plug-in recently enabled this Lightroom setting to help people choose where Lightroom creates the temporary copy of the photo during export/publish. Tree Mirror error: ‘Unable to copy photo’. If the same foto is not existant before, it will be copied. Looks as it is not possible to overwrite the exiting file. The module is configured to “alwasy overwrite”, but it does not. Any ideas how to get this working (again)? It should now be fixed in version 4.6.4. Please use the plug-in’s Update button to get the latest version. 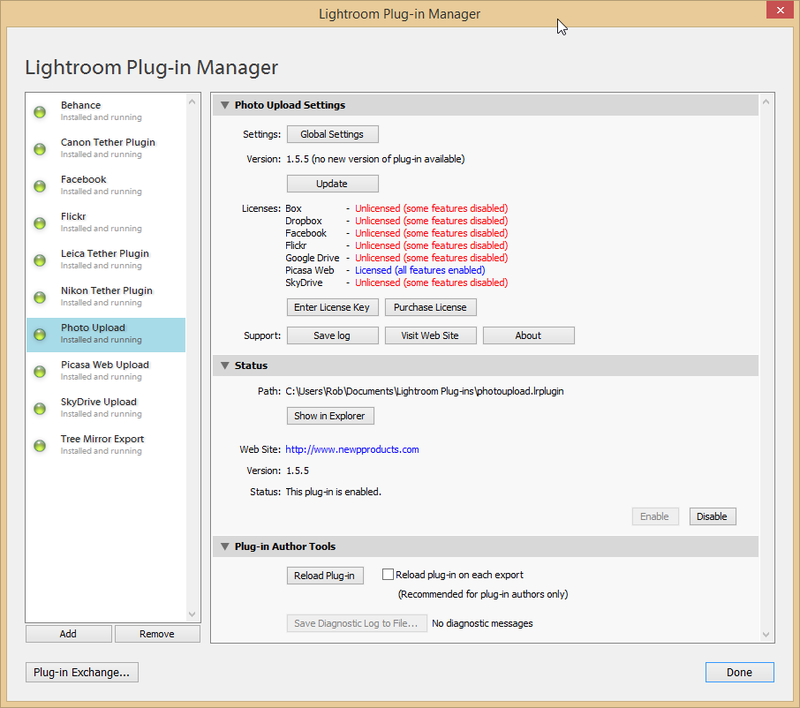 The plug-in has now been updated to work with Lightroom 6.12. Please use the plug-in’s Update button to get the latest version. “Picassa Web error: ‘HTTP/1.1 400 Bad Request, Content-Type image/x-adobe-dng is not a valid media type.’ (1). The same file, uploaded manually, works fine. Should now be fixed in version 4.6.3. Please use the plug-in’s Update button to get the latest version. Bought and installed Photo Upload for Smugmug (via Adobe’s add-on site). And the photo upload shows up just fine in LR’s plugin manager. But as I understand it, Tree Mirror should be part of the “package” – but it does not show up. That’s a bummer, because I was specifically interested in Tree Mirror’s abitliy to … well, mirror folder trees. Hi. You’re almost there. Tree Mirror is part of the package. Most people want to use Lightroom’s Export for Tree Mirror, see here – http://www.newpproducts.com/lightroom-plug-ins/tree-mirror/using-tree-mirror/. 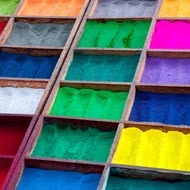 I am using the “Photo Upload” sucessfully to publish photos to my personal FB account. Can I also use it to publish to an album on a FB page that I manage (e.g. a “fan” page)? How? Hi, yes you can upload to FB pages (but not groups). When you go through the account authentication process using the Add/Refresh button in the plugin you will eventually get a list of all FB accounts and pages your FB user can manage. However! I have noticed recently that when I upload to Zenfolio (using the export method) to an existing gallery, it keeps the gallery at 24 pictures, removing the oldest photo in the process. Is this currently a known issue? Hi. You found a bug with the plug-in’s search for existing photos. It had found an existing photo with the same file name as the photo you were uploading, so deleted the old photo first. This behaviour should only take place if you have the setting value being “If names match, delete”. Thanks for reporting the problem and confirming the fix (v4.6.2) works. I am successfully using the uploader to publish to a Facebook album under my account. Can I use it to publish to an album on a page I manage? How? Yes, you can upload photos for Facebook pages. You will need to use Add/Refresh to add a new Facebook account to the plug-in. When you do, this as part of the authentication, the plug-in will offer you a list of pages that you manage and you should choose the desired page. In General Setting/Existing photos and video’s one can choose: 1) if names match duplicate 2) if names match skip 3) always duplicate 4) always skip. In an earlier version it was also possible to choose: if names match overwrite. Are there any plans to bring back this possibility? It would save me a lot of trouble when I want to update already uploaded photo’s by a modified one with the same name. Or is there another possibility to overcome this workflow? Any ideas? That option is no longer available. You’re probably aware, I’m sure, but in February 2017 Google changed what could be done via Picasa Web. This included preventing existing photos from being updated or deleted. See these notes – http://www.newpproducts.com/lightroom-plug-ins/support-faq/#7_Feb_2017_8211Google_Photos_Picasa_Webchanges_eg_albums_cannot_be_created. Wish I had a better answer for you! How long do you think the google photos plugin will last now that picasaweb is being slowly dismantled? Really hard to say. There is no information from Google saying that Picasa Web is due to be dismantled further. With no alternative I’d expect them to leave it up and running as-is for quite a while in its limited form. 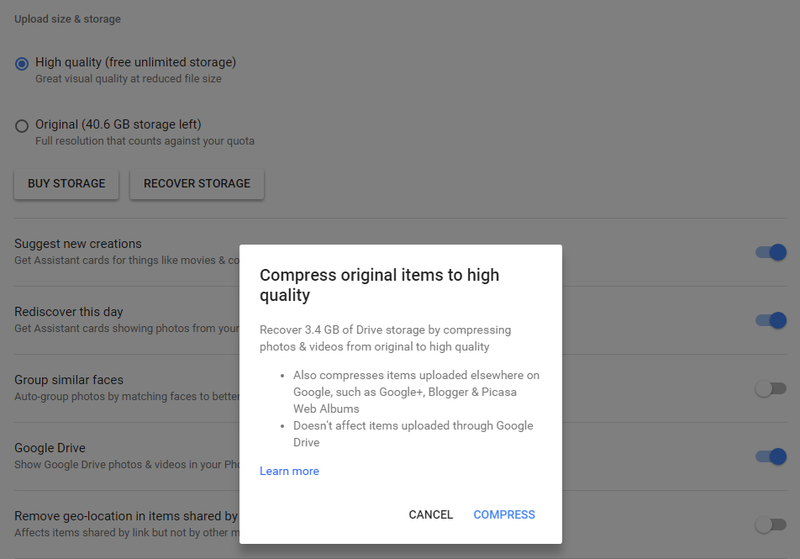 The sceptical amongst us would say that Google have reduced the functionality of Picasa Web in order to differentiate it from Google Drive for archiving photos and files. My upload library to SmugMug has always been set to PUBLIC, no issues there. And the name of my file below that was not uploaded. In this particular case I was uploading only 1 file. Hi – you found a bug, now fixed in version 4.5.7 of the plug-in. Thanks for confirming the fix works. I am unable to export with Photo Export v. 4.5.6. The program tells me it is enabled and operating, and I am uploading to “photo upload.” But when I click “Export” I am not taken to the page to select a Zenfolio album. Instead, I see only folders on the computer hard drive. It sounds like you are only pressing Export once – i.e. to open the Export window. With the Export window open, you press Export again to actually do the upload – it is at this point that you choose the album on Zenfolio. See these instructions – http://www.newpproducts.com/lightroom-plug-ins/photo-upload/uploading-photos-export/. I’m using the Facebook uploader and I’m having an issue. I’m selecting both “Auto-generate Feed Story” and “Create Post” but it’s not showing up in friends’ feeds like a normal post. If I tag someone in a photo, they see it in their feed, but that’s about it. I’ve found that if I edit the post’s text, it helps but that seems like a workaround. Any tips on what I might be doing wrong? How Facebook shares posts and photos is a bit of a mystery, so you may know as much as me… It does the sharing all by itself, the plug-in merely uploads photos and create the posts. However I believe that if you create an empty post (no text) then Facebook does not actually create a post, it just seems to upload the photo. The other thing to look at is your Lightroom plug-in app privacy settings (https://www.facebook.com/help/218345114850283?helpref=faq_content). The photo and post privacy permissions are partly determined by what permissions you gave the app when you first registered it with Facebook. Thanks for replying! I sort of figured this was down to FB’s odd internal workings but wanted to ask. App permissions are setup correctly. I’ll just edit the posts manually once they upload from LR I guess, not a huge deal. Thanks again! I notice that I am getting a (996/1,000) album retrieval message when I upload to Google Photos. Is there a limitation in your upload process or is there a Google Photos limit on the number of albums? The plug-in tries to receive chunks of 1,000 albums at a time. Hopefully you’ll see 1,001/2,000 or similar in the future. I’m not sure if Picasa Web has a fixed limit on albums though. Having a quick search on Google gave this link that seems to indicate Picasa Web has a limit of 10,000 albums. I will know pretty soon on the 1,000 block situation, 10,000 should get me by for a while. Thank you for updating this software! Thanks for sharing your Google Photos workflow. I know quite a few people are trying to work out how best to deal with the restrictions that Google put in place earlier this year. I’m sure your suggestions will help. Any plans for video support for WordPress? The export dialogue supports it and works to file. It would be great if I could upload videos via a plugin rather than going to the draft post and adding it manually! 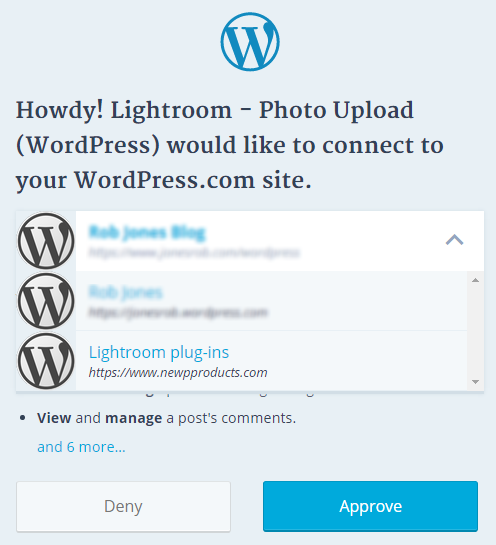 Video upload to WordPress has now been added in the latest version (4.5.4). Can you update the plug-in to that version and give it a go? Videos can now be uploaded to self-hosted WordPress sites. But if you want to upload to wordpress.com sites then, due to a wordpress.com security change this year, you can’t currently do this without following one of these instructions – https://tribulant.com/blog/wordpress/how-to-fix-sorry-this-file-type-is-not-permitted-for-security-reasons/. Flickr uploading is completely broken for me, and has been for a few days at least. Though it comes and goes. Flickr error: ‘HTTP status 0, Unexpected network connection status. It sometimes does actually create the album on Flickr, though there’s never anything in it except Photo Upload’s “Icon.png” that it uses as a placeholder for the new albums (and looking back, I have dozens of these scattered throughout my photo stream from the last several months, that I’ve had to now go back and delete manual through Flickr’s site). When uploading to existing albums, it only uploads some photos sometimes, and even those that it does, it doesn’t mark them as published anymore in Lightroom. It also doesn’t actually add them to the album on Flickr – they’re just orphans in the photo stream. It reports no errors when this particular error occurs. I just started using your plugin to upload to Zenfolio after using Jeffrey’s for many years, so I have thousands of photos on Z already and existing galleries. I set up a collection in your plugin using the same settings, and pointed it to the existing gallery on Z, the same photos are shown in my lightroom as zenfolio, but when I Publish, it is duplicating and triplicating the images on Zenfolio. I am using the setting “if names same update”. ALSO how do I set it to delete any images online that are NOT in the local lightroom collection? My collections often change due to keyword changes, so I would need any removed from the collection. Please advise asap. thanks. You found a bug with the “if names match update/delete” setting behaviour. This is now fixed in version 4.5.1 so please use the plug-in’s Update button to get this version. Regarding your other question, the plug-in does not allow you to delete photos from the online collection that do not exist in your local Lightroom collection. Thanks for raising your first issue. Is there a way to just sync metadata changes? I would love to be able to sync just descriptions. I mean for google photos. If the photo is already in google photos how do I sync just the description? hope that is more clear. The plug-in does not currently allow you update only the photo metadata. It’s a good suggestion though so I’ll see if I can add such a capability. However… as of Feb this year Google Photos (via Picasa Web) no longer allows updating of photos. 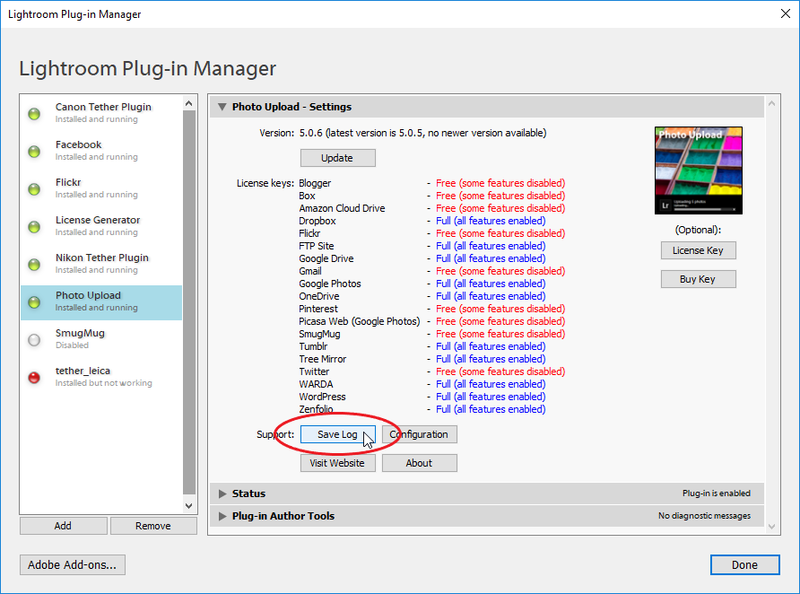 If the plug-in gets such a feature in the future, then sadly it will not be able to be applied to the Picasa Web service. Can the plugin support OneDrive for business? No, the plugin does not support OneDrive for Business as that is very different to personal OneDrive and has an authentication that is specific to each customer. Microsoft I think said they intend to make the authentication easier in the future, but right now it is not feasible for the plugin to work with OneDrive for Business. Hi! Love this plugin, but lately my uploads to Flickr have been DOGGED slow. Like, 5-10 minutes per photo. I’m not sure how to best debug this, but have changed no settings in my Lightroom CC or the Publish Service. Is there a way to have it upload to multiple services at once? For example my Flickr and 500px accounts at the same time? No, I’m afraid not. Sadly it would also not be trivial to add this in the future. Amazon Prime Membership allows unlimited photo storage, but the Photo Upload Lightroom-plugin assumes user must have an unlimited Amazon Drive storage account. Is there a way to use the plug-in with Amazon Prime Photos? I’m afraid Amazon only provide an interface for Amazon Drive, not for Amazon Prime Photos. There is an overlap though between the two. From what I can see, photos uploaded to your Amazon Drive account do not take any of your storage allocation if you have Amazon Prime Photos. Once the photos are in Amazon Drive you can easily use the Amazon web interface to convert a Amazon Drive folder into an Amazon Prime Photos album. I just licensed the Zenfolio feature…thank you! “Zenfolio error: ‘HTTP/1.1 498 Invalid format, This file format is not supported or the file is corrupt.’ (1)” followed by the file name. These videos come from two different cameras (iPhone 6 and Canon G15), and I have tried uploading unedited videos as well as videos processed by iMovie 10.x. All error out with the same message. However, the videos CAN be uploaded directly to Zenfolio using their web uploader, so I don’t think the videos are actually corrupt. I’m not sure the plug-in has ever been tested with videos for Zenfolio before(!). I’ve made some changes after also seeing the error messages you reported and hopefully all is working now. Can you use the plug-in’s Update button to get version 4.3.7 and give it a try? That seemed to do the trick! Thanks so much for the quick resolution! Your chief competitor :), Jeffrey Friedl, has a similar problem with his plugin for Zenfolio. Are you two on sufficiently friendly terms to share the wisdom? Thanks for letting me know that the update has worked for you. I do need to contact Zenfolio about video uploads as I think Zenfolio make it very difficult for a plug-in to track videos that have been uploaded. Currently if you use this plug-in to re-upload a photo then the old one will be updated or replaced but re-uploading videos will leave you with duplicates as it is non-trivial to identify the existing video. Yes, I noticed that, too (about what happens when one reuploads videos). I like Zenfolio, and don’t relish spending the time to move my albums elsewhere, but they have some poorly implemented pieces they just won’t spend the time to fix. I havn’t changed anything at my system. Do you have an idea what’s wrong? You found a bug. It’s now fixed in version 4.3.7. Many thanks for working with me to confirm the bug is now fixed. Manually uploading the same video to Google Photos via their website results in the video being playable immediately. Have you seen this issue? I tried searching but found no reference to it. I have just purchased the Google photo plugin (piscas). In the existing photos and videos dropdown. I have no listing for a photo to be updated. This is the main reason i want to use your plugin. Google have sadly prevented 3rd party apps and plug-ins from updating and deleting photos. If ifp3 give you FTP access then you could try connecting over FTP. The Photo Upload plug-in supports FTP (and SFTP on Windows). Using FTP means you’ll need to know your FTP site configuration, so this may be more technical than you want to spend time on. You can try the plug-in for free – and if it works well for you then you could buy a license key at that time. That sounds like you are trying to upload a photo to a “Private” gallery. SmugMug started to prevent this a few weeks back – I don’t know their rationale why (I even asked them why in their support forum, but no reply – https://dgrin.com/discussion/261330/cannot-upload-photos-to-private-galleries-using-v2-api). Hi, FTP upload in Photo Upload executes the upload even if I select Cancel in the “Display settings” dialog. That is when I have selected to show the settings dialog before publish. Yes, that was actually the intended behaviour. The dialog showed your settings and if you hit cancel then it would ignore any changes you made to the settings. However in this case the bigger context was that your were publishing and cancel at this point makes more sense to cancel the publish operation. So I agree and have updated the plug-in with version 4.3.4. Please use the Update button to the latest version. First thank you for your support here. Using/have used LR with several publishing plugins like Smugmug Onedrive NexGen Dropbox etx and all with great success. I’m doing something wrong with the upload for Pinterest. I believe I have it set up right. It creates the board but sits there w no progress on the upload and after long enough time I close it, go to Pinterest and no images wre uploaded. I’m a bit confused by this one. Could you make sure you have the latest plug-in installed – it should now be version 4.3.3. 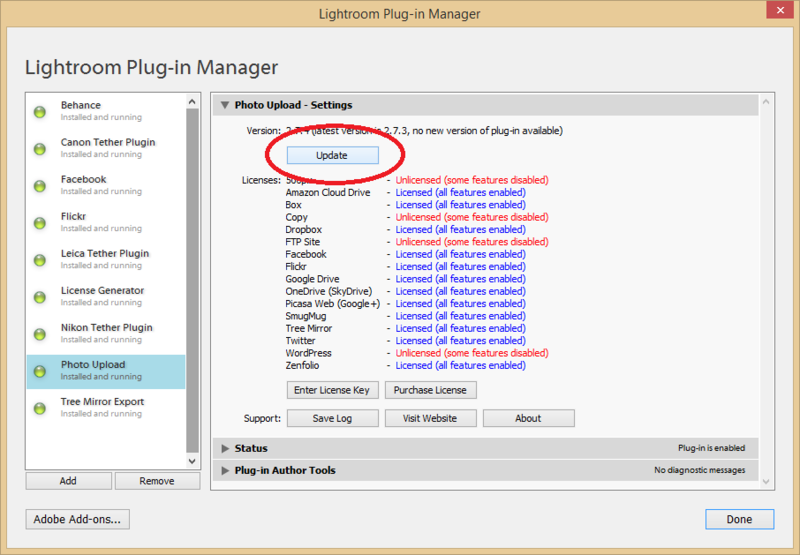 You can use the plug-in’s Update button in the settings for it in Plug-in Manager to get the the latest. I’ve had a look and can’t reproduce the “no progress” you have mentioned. I did find a bug that prevented albums being created and I’ve fixed that one, but that doesn’t sound like what you reported so I thought I’d ask you to check you’re on the latest version. Please try with the latest 4.3.3 version and let me know how you get on. is there a way to connect to the Amazon Drive on the amazon.de Web page? Amazon have a .com login page for apps. You can still log in using your German account. For example, I have a UK account, not a .com account. Flickr Upload from Lightroom: All went well downloading and authorising with payment key. Everything looks fine in Plugin Manager. However when I hit the “Publish” all that appears on Flickr is a blurry rendering of your logo! HELP!!! You found a bug in the plug-in which is now fixed in version 4.3.2. If you uploaded just one photo to a new album then a plug-in logo picture would be left in the album until you uploaded a second photo. Thanks for reporting this, and confirming the fix works. Do you know if it is still in any way possible to make an album “public”. It used to be possible through the plugin to create an album and set it to public. But somehow google doesn’t want us to share our albums with the world. The plug-in setting for making an album public was only used when creating albums. Since Google prevented apps from creating plug-in then the option had to be removed. You can create albums in the Google Photos web interface and then you can use that interface to share the albums (which seems to be the same as making them public). However please note that there seems to be a weird quirk by Google Photos that albums created as “shared albums” are not visible to apps like this plug-in. You have to create them as regular “albums” and then share them afterwards, from what I can see. To get around the Google “new album situation,” I created an album name !Work. It is the first album found at the bottom of the plug-in display because “!” is a very low ASCII character. I then upload my images to that album and move them to a new photo created in Google Photos. That is sure a messy way to do it, but the best I can think of for now. Ugh. How do I get the location and Person tag infos to export to Facebook? Facebook does not allow a plug-in to set a photo’s location and person information. It says “an internal error has occured” while retrieving the album list. That just happens with Fotolia, other ftp sites work as a charme. Yup – sorry, you found a bug. Should now be fixed in version 4.2.5. Please use the plug-in’s Update button to get the latest version. Found a bug and solved in less than 24 hrs, what an amazing support!!! Ah, you found a bug. Should now be fixed in version 4.2.4. Please use the Update button in the plug-in settings to get the latest version. I updated to the latest version, and it no longer creates a new album, but only has the option to redirect to an existing album for Google Photos. Any ideas? I am receiving an error as shown below when trying to create an upload to DropBox. I am on Version 4.0.8 and see a new version available. The new version will not install. Please advise how to correct both issues. An error occurred while attempting to update the settings for this collection.